Freight cost can be complex, and LTL shipping rates can be a maze of confusion for the uninitiated. However, a little bit of know-how and understanding of how the freight shipping industry calculates freight charges can save your business hundreds and thousands of dollars when you understand the 11 factors that go into LTL contracts and LTL freight rates. 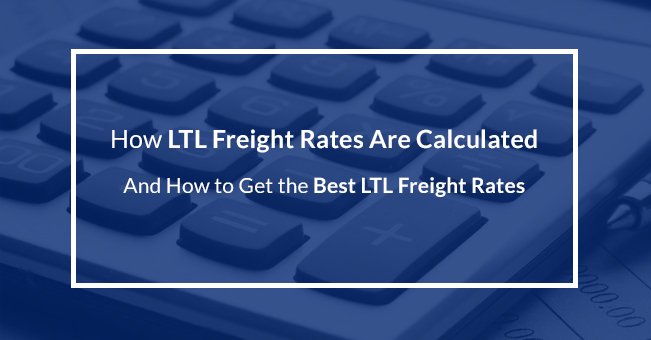 If you are just jumping into the world of LTL freight, you’re probably discovering that of all the many little details you need to understand, LTL freight rates are the most confusing. However, it’s worth becoming familiar with them as they will help you develop reasonable expectations on what to expect, as well as negotiate a better deal for your shipment. LTL (Less-than-Truckload) freight shipping is commonly used by businesses with shipments that are too large to post through the regular mail, but not large enough to fill out an entire truck. With the current boom in ecommerce, LTL freight shipping has increased and there are many competing shippers to choose from, each with their own rates and other subtle differences. Unlike other truckload rates, which typically offer costing based on mileage or hundred-weight (CWT) plus fuel charges, LTL rates are regulated by many different factors, each of which can affect the pricing of your shipment. Needless to say, if you’re just starting out, investigating all these factors can be a daunting task—but it’s not an impossible one. With each LTL shipment weighing between 150 to 20,000 lbs., knowing the specific detailsof your shipment can save you a lot of money (better yet, the savings are compounded over multiple shipments). It’s knowing the details and tricks that will help you to keep shipping costs down and ensure that you get the best rate. It’s vital to pay attention to these factors, as if you don’t have the specifics to hand, shipping costs could escalate by as much as 40% unnecessarily through fees. The only way to avoid these is to be diligent when it comes to preparing your details for a quote. There is no denying that this can be a complicated and bewildering industry when you first start to read about it, but understanding how rates are calculated is necessary in the long run when it comes to keeping costs down and shipments going out. All LTL carriers use these factors when calculating ltl freight rates. The LTL freight quote you receive will be largely dependent on the information that you provide for the designated shipment. Less is more when it comes to weight, and typically you’ll pay less for each extra hundred pounds added to the total, with “weight breaks” also considered. Also known as “price breaks”, it’s always a wise idea to hold onto your goods until you’ve tipped over the breaking point to save even more money. With each LTL shipment weighing between 150 and 20,000 lbs., you can expect to find up to 6 class weight breaks per shipment, giving you options. A pound of lead and a pound of feathers may weigh the same, but have completely different volume and density. Density is determined by dividing weight by total cubic feet of your shipment—be sure to measure the longest side for accurate results. Knowing your density helps you establish your class. The National Motor Freight Classification (NMFC) by the National Motor Traffic Association (NMTA) has classified freight into 18 different classes, numbered 50 to 500. The classification is done through metrics such as density, weight, ease of transport, fragility, liability, handling and value to name a few. The higher the class, the higher the LTL freight weights. As you might expect, the larger and more fragile your freight, the higher its classification and rates will be. As you might expect, the more mileage your freight takes, the higher your rate will be. Remember that many LTL freight operators only operate within a certain area, so if your LTL freight is travelling further, your cargo will be transferred to another carrier (a process known as “interlining”)en route to its final destination—this can add a premium if the other carrier has higher minimums and lower discounts. Base rates vary from carrier to carrier, and are typically calculated per CWT (100lbs). The CWT itself is based on your freight classification. It is worth noting that base rates can fluctuate if carriers need additional volume and gross costs for lanes, so always point this out where possible. Much like airlines, demand can affect pricing in slower times. FAK is a useful arrangement for those seeking LTL freight rates for multiple products with different classifications. For example, if you had products ranging from 75 to 125 in classification, you could negotiate a FAK of class 100 and reduce expenditure on your rates significantly while avoiding troublesome pricing discrepancies. The Absolute Minimum Charge (AMC) is a rate that is increasing the most. This is largely because minimum shipments cost more than larger ones. For that reason, while your contract rates might experience an annual increase of up to 3%, it’s not unheard of for the AMC to be boosted by 7% year on year. Negotiating with different LTL carriers over different lanes can save you a lot, especially if you have done your homework and analyzed factors such as lane activity and your own freight data. Carefully negotiation here can give you a strong position and improved LTL freight rates. If you are shipping on a regular basis, you can negotiate discounts of 18% to 25%–that’s a good chunk of change per $100,000 of shipping costs. In a volatile market, third party logistics providers like your LTL carrier are open to discounts with a mutual benefit. Accessorials refers to extra services, and these vary from carrier to carrier. Common services are accessing limited locations, lift gate service, and residential pickup and delivery. One surcharge you’re bound to see in every rate quoted is a fuel surcharge, as it is an unavoidable factor to each LTL shipment cost. You might also note surcharges for shrink-wrapping and palletizing. It is possible to negotiate to get such fees lowered or even waived—so check with your account manager. No matter which LTL freight carrier you work with, these 11 factors will all become constituent parts of your freight charges. knowing how LTL shipping works and how to use that to your advantage will help you garner the best less than truckload rates possible for your next shipment and beyond and lower your freight cost. Doing your research and knowing your options can drastically drive costs down—and not just from avoiding a potential 40% increase to shipping costs from not having your specifics nailed down! The fact that such an intricate web of classifications and calculations govern LTL freight rates makes building a strategy for reducing your freight weight a little easier once you know the factors that affect cost. It is through understanding of how each of these factors breaks down and then using those to structure your own LTL freight shipments for best rates. With proper cost planning and knowledgeable negotiation with LTL carriers, you can gain significant ground on discounts. Saving on LTL Freight Cost can result in big savings over time. One area to focus on is your CWT base rate and how it relates to weight and price breaks. Just making a simple tweak here and there can save you hundreds of dollars with each LTL freight shipment—and over the course of the year, those savings can compound and add up to create substantial savings for your business. If you are having issues with your LTL freight costs or just managing your rates efficiently, looking at each of these factors in relation to your typical shipment and negotiating with your LTL freight carrier is the best way to find a solution—and reach an agreement. Here at Compass Logistics, we make LTL shipping hassle free for our clients but working with you to find the best solutions for your needs and your budget. Contact us today for a free LTL Freight Quote and learn how we can help you save and cut cost on your future shipments.